Dr. Rick Harding (Dudikoff) is a scientist working for the FBI's chemical weapons unit. 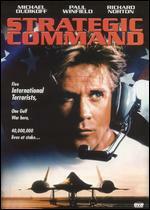 He also must be the "One Gulf War Hero" of the movie's tagline. All Harding wants to do is get home to his wife Michelle (Wyss) and have a quiet life. But a terrorist organization led by the evil Carlos Gruber (Norton) breaks into the lab and steals "120 Gels of Bromax 365" which is, and I quote, "Potentially the most dangerous element...EVER CREATED." The small team of black-clad baddies then hijacks a plane heading from California to Washington D.C. On the plane is the Vice President of the United States, Charles Baker (Michael Cavanaugh) , his beautiful assistant Amie (Bok Yun Chon), the vain, cowardly news reporter Phil Hertzberg (Cranston), and of course, Michelle Harding! She was assigned to interview the VP when the terrorists struck. The terrorists demand the release of fellow bad guy Ashrat from prison, and 100 million dollars, or they will blow up the plane with the Bromax on it, which will, and I quote, "Kill every living organism in a 200 mile radius." Now Harding, working with his superior Rowan (Winfield), has to team up with some anti-terrorist agents that don't like him very much, including Rattner (Nick Corri) and Ernie (Marcus Aurelius) to execute "Operation Intercept".Will Harding and his team save the hostages? Will they get the Bromax out of the hands of the bad guys? What will happen to the plane? What writer came up with the name "Carlos Gruber?" Directed by Rick Jacobson of Ring of Fire (1991) (uncredited) and Night Hunter (1996) fame, and produced by Andrew Stevens which would explain the Desert Thunder (1999)/Stealth Fighter (1999) recycled plane footage (and the "assemble a team" theme), Strategic Command is even more of an obvious ripoff of then-current Hollywood films than usual. Most notably Executive Decision (1996), but also Air Force One (1997), Die Hard (1988), Passenger 57 (1992), The Rock (1996) and Broken Arrow (1996). It even recalls Counter Measures (1999), down to the silly vomiting people that are exposed to the Bromax. Supposedly it even has some music recycled from Counter Measures, and yet again Dudikoff is trapped in an enclosed space, be it sub, plane, or some sort of vehicle. Old buddies from the American Ninja (1985) days Norton and Dudikoff are back together again. Norton is sinister and not very TV's Andy Levy-like as the terrorist with the slicked-back black hair. Despite some vague talk of his being German, Norton's Australian accent is still proudly on display. Just naming him the confusing and silly "Carlos Gruber" doesn't make him German. Or Mexican for that matter. Plus in Die Hard, Alan Rickman is named Hans Gruber. Of all the German last names that exist, couldn't the writers find another one besides "Gruber"? A funny moment comes when he "disguises" himself as a cameraman to sneak on the plane with the Vice President. All he does is add a funny mustache and glasses, hold a fake camera and say "I'm new". Then he's holding a gun to the VP's head. It is interesting watching a terrorist/plane movie in this post-9/11 world. Also in the funny department, the evil, deadly substance is called Bromax. The characters all talk about it with dramatic, hushed tones. But every time they say it, it sounds like they are saying "Bromance". "That Bromance is going to kill everyone!" "We have to get the Bromance! ", etc. Dudikoff is his usual cool self, and even has a pre-CSI dramatic sunglass removal line. Clearly the CSI people ripped off Strategic Command. Circle of life. Probably the most interesting casting involves Bryan Cranston as Hertzberg. He's dead last in the credits, but his role is fairly substantial. In any of his interviews, either for Malcolm in the Middle, Breaking Bad or anything else, has anyone ever asked him about Strategic Command? Because they really should. We want Cranston's take. For a competent, if patently obvious knockoff DTV flick with a cast of familiar faces, check out Strategic Command, but your expectations should not be high. I saw this flick a couple of times when it was aired on TV. And all I remember from it is the "I'm new." part. Still, I'd watch it a third time, too. I love The Dudemeister. Got to love Dudikoff! (and Norton) They rule! One of my very early reviews over at Explosive Action, this one. I did love the "I'm new" part, so ridiculous. Overall I agree, don't get your hopes too high and it's enjoyable enough. 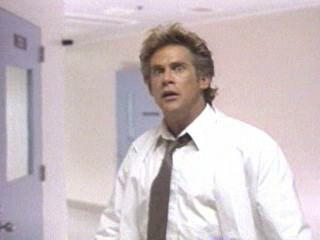 Dudikoff's look in that photo is PRICELESS! Can't agree more, the photo is truly hilarious! This is our last Dudikoff for a little while, have to buy more of his movies! I've been looking to get this one up myself. Norton and Dudikoff just generate too much heat to ignore for too long. Great review. Thanks! I look forward to when you review it! Its bad acting, well 2nd class then. The army Capt talks like some gang member. Haha! Good memory, don't remember that at all.